Wye House is one of the most important and well documented plantations in Maryland. Joint Heritage at Wye House is a major interpretive exhibition shown at the Academy Art Museum, drawing on archaeological evidence from the slave quarters and from the Green House (later called the Orangery) at Wye House. The archaeological exhibition, on display at the Academy Art Museum in Easton, MD, from August 24 to October 13, 2013, contains archival sources, household objects, books, recipe collections, maps, and artwork related to the people who lived and worked at Wye House. Organized by Anke Van Wagenberg, Museum Curator, and visiting curators Mark P. Leone, Elizabeth F. Pruitt, Benjamin A. Skolnik, and Amanda Tang from the Department of Anthropology, University of Maryland College Park, Joint Heritage at Wye House explores the co-existing cultures and their creations at the plantation in the 18th and 19th centuries. The archaeology of Wye House involves eight years of excavations on slave quarters, slave industries, and buildings associated with the shipping of agricultural goods that made the plantation wealthy. The Lloyd family, founders and owners of Wye House, owned a large numbers of slaves. 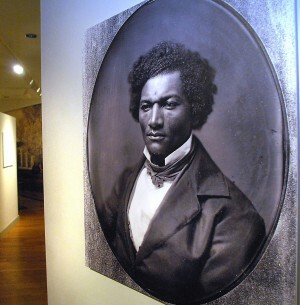 The young slave Frederick Douglass (1818 – 1895) was among the people who lived and worked at Wye House. The exhibition concentrates, not on the evils of slavery, but rather on the culture made by Africans and African Americans on the property, including the combined work of the Lloyds and their enslaved Africans. One section of the exhibition includes the history of Wye House, its structures, and people, including books on architecture. A second section focuses on excavation methods, materials excavated, and interpretations of the objects. A third section interprets the Green House (later called the Orangery) and its archaeological data and meaning, derived from pollen grains, food remains, and thousands of broken dishes. The Green House interpretation explores farming, domesticating new plants, and a native pharmacopeia. The population of Wye House section introduces the lives of the Lloyd family, enslaved Africans, and the free people who worked with them after the Emancipation Proclamation, and includes a searchable database drawn from previously unavailable lists of slaves, including hundreds of full names. The ability to fully identify the historical individuals who lived and worked the plantation is a rare and remarkable feature of the exhibition. In a related vein, historical family cookbooks will trace the introduction of local ingredients and the influence of African-American cooks in the emergence of southern cuisine. On September 26, 2013 at 6 p.m., the Academy Art Museum in Easton, MD, will present a lecture in its Kittredge-Wilson Speaker Series entitled, “The Archaeology of Time Telling at Wye House for Black and White Production: Floral Clocks, Time and the Greenhouse” by Professor Mark P. Leone and Elizabeth F. Pruitt, Department of Anthropology, University of Maryland, College Park. Pollen grains found in the rooms of the greenhouse at Wye show an array of over 100 plants used for food, medicine, and household chores. This lecture sees the greenhouse not as a decoration, not as an isolated building, but as the pivot around which the woods, bogs, fields, and gardens at Wye were made to predict time, like a clock. In addition to food and medicine, the array of flowers and leafy plants in the greenhouse and in the surrounding formal garden could have been used to tell the time of day similar to the manner of a floral clock. The whole purpose of a floral clock at Wye House would be to have an independent measure of time beyond the factory bell that sent slaves to the field and the overseers’ commands that kept people there on the owner’s clock. The exhibition is made possible by the generous support of Richard and Beverly Tilghman, the University of Maryland, College Park and the Frederick Douglass Honor Society. Additional support was provided by The Historical Society of Talbot County and The Maryland Historical Society, who generously loaned materials, as well as Patrick Rogan for exhibition design. The exhibition is made possible by funding from the Maryland State Arts Council and Talbot County Arts Council. This project was also made possible by a grant from the Maryland Humanities Council, through support from the National Endowment for the Humanities. Any views, findings, or conclusions expressed in this exhibition do not necessarily represent those of the National Endowment for the Humanities or the Maryland Humanities Council.